The BKOOL Pro trainer is the upgrade to the hugely impressive BKOOL Classic trainer. In nearly all areas it is the same as the Classic, but different in design slightly to offer greater stability due to its extendable support arms and it is quieter. 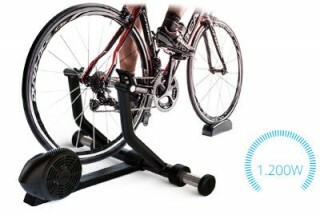 In fact the BKOOL Pro is probably the quietest turbo trainer you can buy. BKOOL offer more than just a turbo trainer, they offer a full immersive and interactive experience to make sure you get the most out of your training sessions. Not only do you get an amazing workout but you also get a fun and motivational experience due to their interactive films and now NEW 3D computerised virtual reality environments. 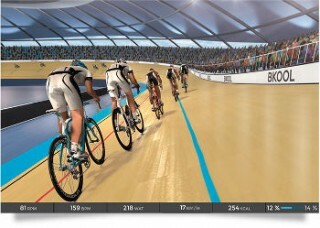 With both the films and the 3D worlds you can ride freely and even race other real-life cyclists. BKOOL has a full and competitive online community for you to chat and race with. 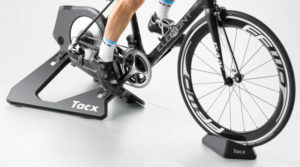 The 3D virtual reality experience along with the online community was once only available with Tacx trainers, which cost at least twice as much as the BKOOL trainers. The BKOOL Pro offers resistance equivalent of up to 20% gradients, and the trainer is fully synced and calibrated with your computer (desktop or laptop), and now even with your tablet. This means when you are riding up an incline the resistance you feel increases proportionally and realistically. Pretty amazing stuff. Training indoors was once boring, but not anymore. If you wanted to know which trainer to buy it is this one. In fact it comes top of our 2014 / 2015 Best Turbo Trainer Review and also our Best Virtual Reality Turbo Trainer Review.